A New Type of Leaderboard: Season Stat Grid! We are debuting a new leaderboard today, the Season Stat Grid. It’s a little different than most of our leaderboards. Instead of having multiple stats in columns for each player, we are showing just one stat on the page and displaying multiple different seasons across the columns. This will allow readers to compare players to other players and themselves across several years. 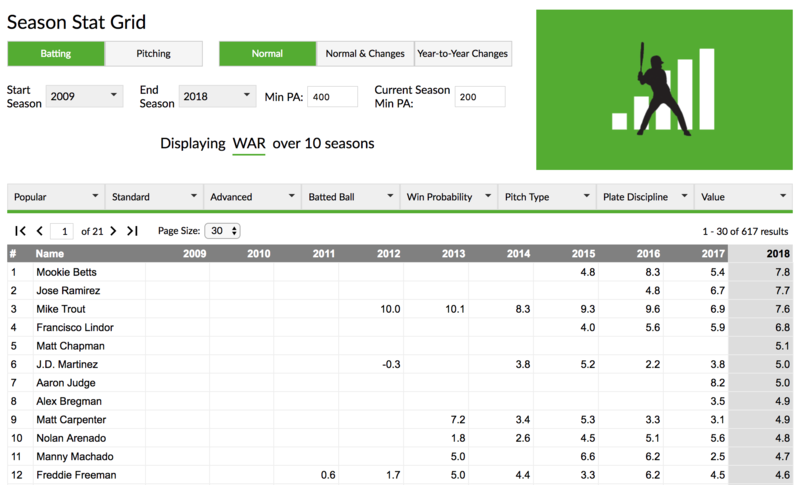 You are able to select from most batting and pitching stats available on the player pages. There is a “Popular” stat menu which will always contain WAR along with other frequently used or otherwise important stats. In addition to the normal season stat, there is an option to display the year-to-year changes. The changes look one season back and are displayed in blue or red indicating the direction of change. You can view these changes alongside the normal season value or by themselves. When comparing past seasons to a season currently in progress, you might need to select different playing-time minimums, so we have two controls: one for all completed seasons and one for the current season. During the current season, 2017 and prior will be bound by the “Past Min PA” value while all 2018 data is bound by the “Current Season” value. The grid will ignore seasons that don’t meet the criteria, so if a player has a short season, like Giancarlo Stanton did in 2015, that value will be blank. The grid will return any player that has a criteria-meeting season within the time range, but it won’t return a specific season unless it meets the criteria. We cap the maximum number of seasons displayed at once at 16 season, so you can view 2000-15, but you couldn’t extend it beyond that range. This is done for a few reasons, including processing time and table size. The year-to-year changes are calculated one season back and won’t be displayed if the player did not have a qualifying stat value the previous season. This also means the first column of the table will never have changes calculated in it. When a year-to-year change option is selected the grid will only sort by the change value and not the normal season stat value. We hoped you liked reading A New Type of Leaderboard: Season Stat Grid! by Sean Dolinar! Nice! Any plans to support adding an aggregated column on the far right (total/average/min/max/etc.)? Could be useful.